A team from the NASA Astrobiology Institute found bacteria that use arsenic in cells in place of the phosphorous in Mono Lake, California. The breakthrough reveals new possible forms of life on other planets that scientists might have failed to research because it didn’t contain the six known elements to support life on Earth: carbon, hydrogen, nitrogen, oxygen, sulfur, and phosphorus. 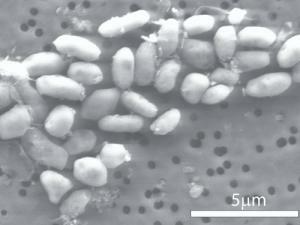 The research article, published in ScienceMag at the beginning of November, anticipates the find of the GFAJ-1 bacterium to ‘have profound evolutionary and geochemical significance’. Earlier this week a robot reproducing itself without human intervention was revealed by researchers at the Fraunhofer Institute, taking us one step closer to a computer dominated world. I wonder what all these discoveries lead to; surely they must converge somewhere.